A 3-week academic program for 12 local high school students to create an original digital humanities research project using archival materials about unpublished, untaught, and taboo aspects of the Civil War in DC. Based on the success of last year's project, we will again officially partner with the DC Public Library. Students will work together on a research project using archival materials housed within DC Public Library’s Special Collections and within other archives locally. The goal of the project is to create and present an original story about the Civil War in Washington, D.C. using digital tools. Learners will work in groups of three to four to determine what they already know in order to begin, what they need to know to complete the project, and what next steps need to be taken along the way. At the same time experts, teachers, and library archivists will make available a 'project briefcase' that points learners to helpful resources. They will leave 'breadcrumbs' for learners to follow, to uncover information, and to use during the project. Instead of a traditional classroom environment where teachers decide what to teach, how to teach, and when to teach, here learners request to be taught specific information based on what they have determined they need to know in order to complete the project. What makes this learning process unique is that students create a story to tell about the archival materials they find rather than having a story told to them. Students will submit their work for selection by committee to present at the 2016 DC Historical Studies Conference. This would mark the third time our students have presented at this professional and academic conference. 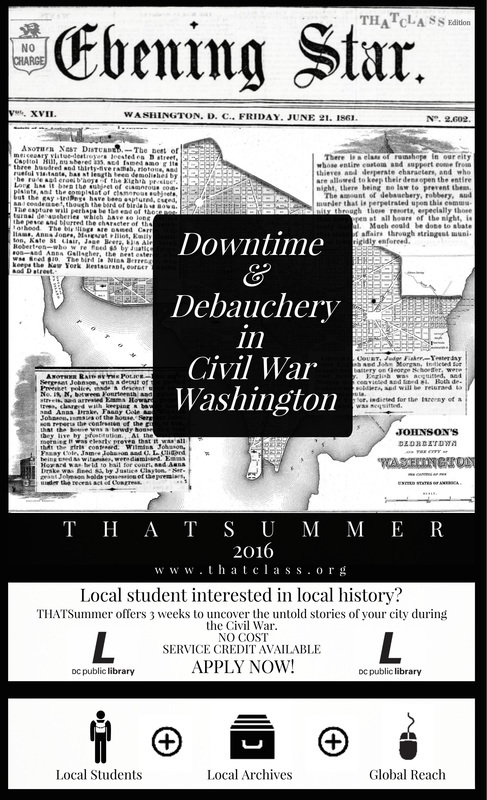 Why "Downtime & Debauchery" and not a more traditional Civil War topic? Because any textbook can tell you that the Army of the Potomac was led by George McClellan, and any decent historical tour of Washington will take you by the current General Accounting Office where, at the house at 334 H Street, President Lincoln gave the duty to protect the capital to McClellan. Snore. But why did this army rarely see battle when they should have fought constantly? Wait for it... Downtime and Debauchery! The city was rampant with booze and brothels, also known as first-class or parlor houses, and lower-class or public houses; as many as 85 in all. In addition to the debauchery, there was plenty of downtime, including music, gambling, and general amusement. What high school student wouldn't want to uncover this history?